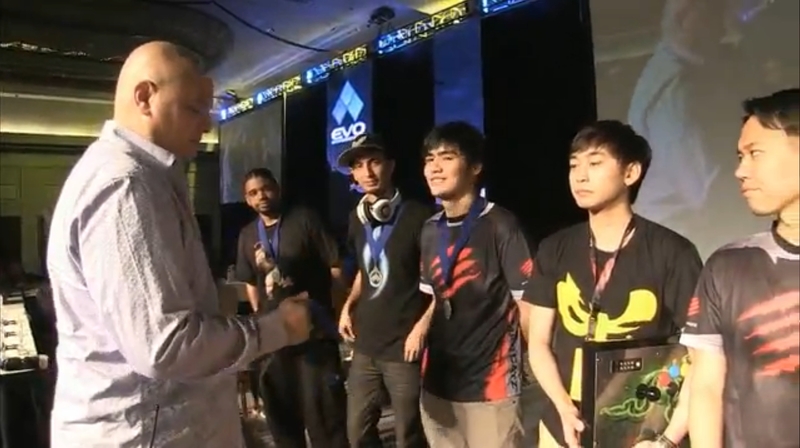 Singapore’s Kun-Xian “Xian” Ho has finished joint fifth place at this year’s EVO 2013 Championship Series for The King of Fighters XIII. He shares the fifth spot with South Korea’s Shin-Min “Verna” Su. While this is not Xian’s best finish for KOF13 in a major (he was KOF13 champion in last year’s Canada Cup 2012), it is up to this point, his strongest finish at EVO, overriding the disappointment of EVO 2012 where he was knocked out early in Super Street Fighter IV: Arcade Edition 2012 (AE: 2012) and barely missed out on the top 32 for KOF13. Xian stuck with his well-known “triple DLC” team of EX Iori/EX Kyo/Mr. Karate for most of EVO 2013, but occasionally swapped in Elisabeth into his lineup. He was sent into the losers’ bracket by reknowned Japanese player Hajime “Tokido” Taniguchi (using EX Iori/Mr. Karate/Kim) just before the top 8. For his first match in the losers’ top 8, Xian (using EX Iori/EX Kyo/Mr. Karate) had to face France’s Fox (using Ryo/Mr. Karate/Chin). Xian managed to take the first point, forcing Fox to switch out Ryo for Iori, and to change his character order to put Chin first. This gave Xian a lot of problems, as he had difficulty killing off Chin. Fox took the second point, and almost won the decisive third match, but dropped several hit confirms with his Iori against Xian’s Mr. Karate, allowing Xian to steal the win with a lucky 2-1 victory. 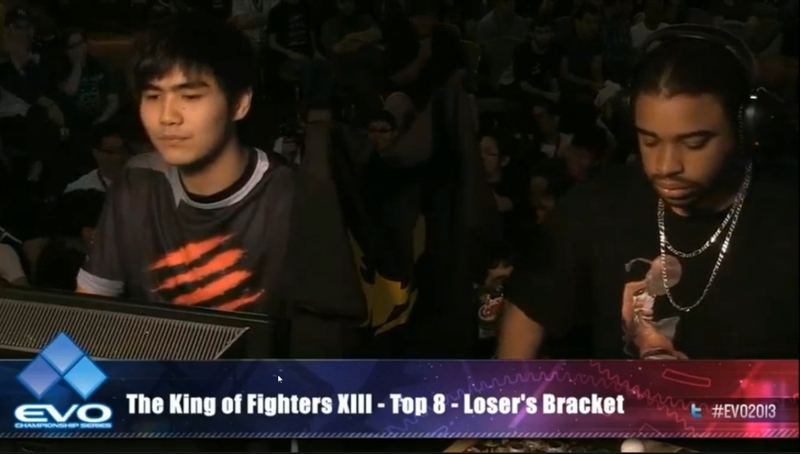 In his next match in the losers’ bracket, Xian had to face Tokido (using EX Iori/Mr. Karate/Kim) yet again, who had just been knocked out of the winners’ bracket earlier. 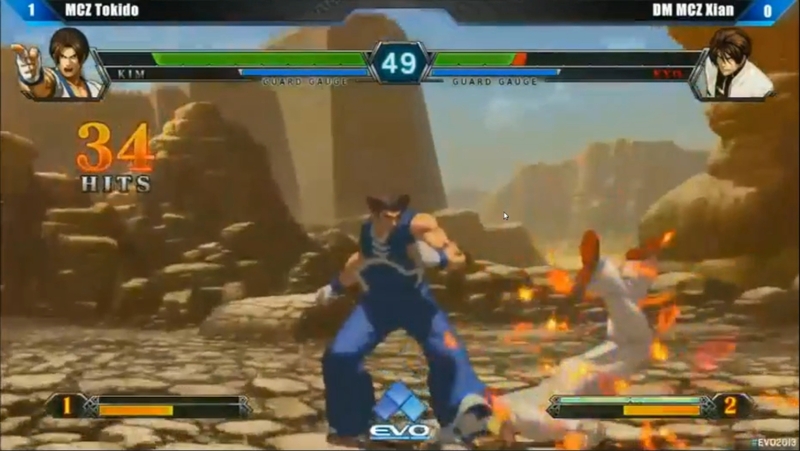 Xian started the first match using Elisabeth/EX Iori/EX Kyo and lost, forcing him to switch back to EX Iori/EX Kyo/Mr. Karate. However, Tokido’s Kim (a heavily-used character in the entire tournament) was too strong and he managed to win the second match again, knocking Xian out of KOF13. Tokido would go on to take the fourth spot for KOF13. The tournament was eventually won by America’s Reynald Tacsuan, who defeated Japan’s Hee-Sam Woo in the grand finals. Xian’s journey at EVO 2013 was not over yet, as he proceeded to win the AE: 2012 tournament later in the day, defeating Tokido in the grand finals to avenge his KOF13 loss. Update (15 July, 4.30pm): Updated the article to reflect on Xian’s victory at AE: 2012.